You’ll be spoilt for choice with this collection! 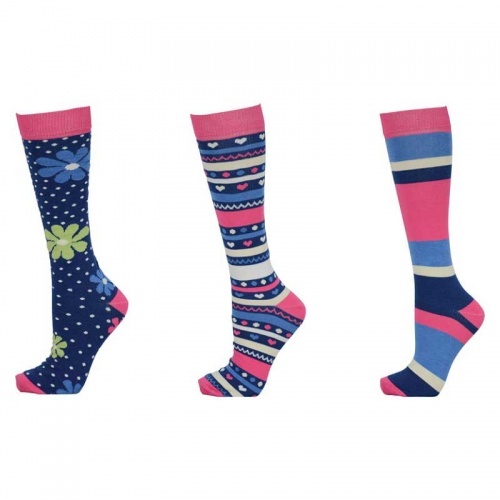 Three pairs of socks make up the set, with a choice of three different colours within the whole range. Choose from a flower and spotty pattern with matching heel, toe and cuff in one design, or bold stripes with toes, heel and ankle that match, or a fun mixture of bright stripes, decorated with heart, spot, and zigzag patterns – and of course with a matching toe, heel and ankle that also coordinates with the other two socks! The long leg design is perfect for wearing underneath boots, keeping legs comfortable. Bamboo properties create a super soft sock that also ensures feet are kept cool and refreshed all day long.